Top indexing services, really mean for the journal editor right? Here we go, lets talk about the top indexing services today. 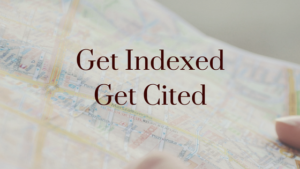 Top indexing services for the journals are something the editors always in search of. The International and national online journal providers are always working on increasing the visibility of the journal articles. In addition, the journal articles are getting more visibility, if submitted to as many number of repositories as possible. Hence,there are the questions raised on many of the repositories of digital contents. Also, on their authenticity and whether it is fake or real. Although, in my view making the contents available for the search is more important. Especially, for the open acess journals than going in to the discussion of the repositories authenticity. Unlike others, few of the repositories may be charging you buck of rupees. Still, i feel it is useful to store your contents in some trusted place. In spite of money you must think of the service you are getting too. Hope so, this list will help you in getting what you are searching. Despite of cost, some of the service providers are also instruct you to improve upon UPI documentation and script also. While, this infact helps in improving ease of indexing your documents to repositories. Above all, the kind of exposure, the articles will get is really appreciable. I feel this information is equally important to my other posts.